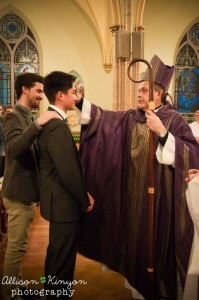 Confirmation is one of the seven sacraments through which Catholics pass in the process of their religious upbringing. According to Catholic doctrine, in this sacrament they are sealed with the gift of the Holy Spirit and are strengthened in their Christian life. The laying of hands signifies the descent of the Holy Spirit. The anointing of the confirmand, the person being confirmed, with chrism, an aromatic oil that has been consecrated by the archbishop is accompanied by the words “Be sealed with the Gift of the Holy Spirit.” This seal is a consecration, representing the safeguarding by the Holy Spirit of the graces conferred on the Christian at Baptism.